There has been a lot of talk about skittish buyers and drops in home sales in the Chicago area. I was curious how that translated to the Winnetka market so analyzed the data and was surprised by what I found. First, showing activity – the third quarter started out slower than 2017 but in the last few weeks, it has picked up and has pulled ahead of last year. So buyers are out shopping and the pace is starting to pick up over last year. That is good news. Next, I looked at Under Contract activity. After all, if buyers are looking but not buying – that doesn’t help the market at all. . . But under contract activity is up in Winnetka over 2017 levels, so buyers seem to be buying more Winnetka homes now that they did in the third quarter of last year. Showings and under contract activity seem to be edging past 2017 levels but it makes sense to check one last metric – inventory levels. And those have decreased in 2018 v. 2017 so there are fewer homes on the market. The months supply of home has decreased from 6.6 months a year ago to 6.0 months. In raw numbers, 158 detached homes were for sale in Winnetka on 10/31/17 and 141 are on the market one year later. So with slightly less inventory and increased buyer showing activity, prices are pushing up. And average prices have pushed higher in Winnetka which is great news for sellers. In sum, the Winnetka market is strong! It’s still a great time to buy and sell! For sellers, make sure your home is prepped to sell and priced competitively to contend with increased competition. For buyers, even though interest rates are rising, they are still at historically low levels and with a strong economy, it’s still a great time to invest in your future by purchasing a home. Whether buying or selling, I’m happy to help. Please call me at 847-778-0540 or email me at Lisa@LisaFinks.com. For details about my exclusive Strategic Seller Program, click here. For details about the comprehensive services offered to buyers, click here. There has been a lot of talk about skittish buyers and drops in home sales in the Chicago area. I was curious how that translated to the Wilmette market so analyzed the data and was surprised by what I found. First, showing activity – it is essentially even with last year and, in some weeks, up over 2017 numbers. So buyers are out shopping in equal numbers to one year ago! That is good news. 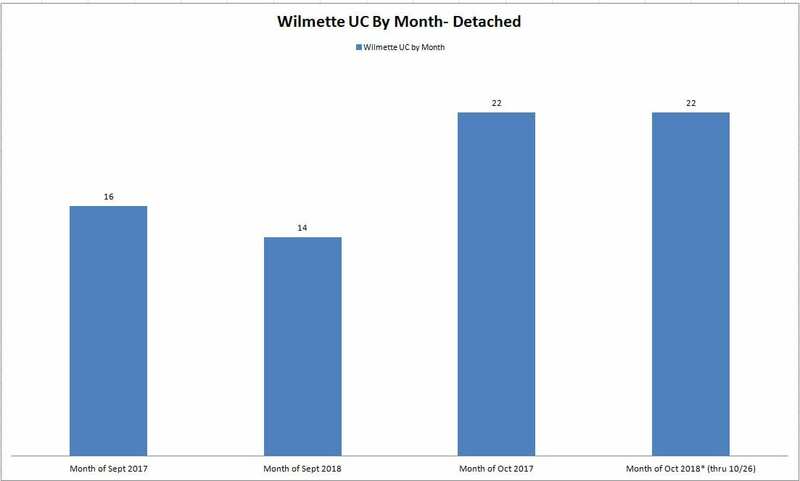 But under contract activity is also about even with 2017, so buyers seem to be buying as many Wilmette homes now as they did in the third quarter of last year. Since showings and under contract activity are just as strong in 2018 as in 2017, I wanted to check one last metric – inventory levels. And those have risen in 2018 v. 2017 so there are more homes on the market. The months supply of home has increased from 5.1 months a year ago to 6.1 months. In raw numbers, 158 detached homes were for sale in Wilmette on 10/27/17 and 179 are on the market right now (10/27/18), one year later. So with more inventory and stable showings/under contracts, it can feel like activity has slowed. . . While a greater supply can lessen demand and push down price – there is more good news in that prices have held firm and have actually seen improvement in the last several months. In sum, the Wilmette market is strong! It’s still a great time to buy and sell! Chicago will still be a homebuyer’s bargain well into the 2020’s.